I'm using Arduino Nano to measure temperature with a 10 kohm thermistor and a voltage divider. My problem is I'm getting only 4.2V on the 5V pin. The power is supplied via a USB cable from a desktop PC. I measured the output voltage of a USB port on the PC and it was around 4.5V. It doesn't look normal. So I suspect the power supply unit of the PC is not strong enough. But it still makes sense to measure the voltage at the 5V pin since there is no guarantee it's exactly 5V. Its error will affect the calculated resistance of the thermistor. So I got it by connecting the pin directly to the A1 pin. On the other hand, it seems to me Arduino internally and digitally knows the value of the supply voltage. So it would be faster and easier to get it rather than using the A1 pin. But I don't know how to do it. After searching on the Internet, I could find only these things which didn't help me much. I also considered using an external power supply, say 9V to the VIN pin but I don't feel like doing that much. 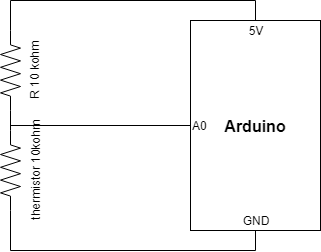 How can I measure the supply voltage of Arduino without using an analog pin? You can measure the voltage of the internal (approximately) 1.1V reference voltage using the ADC and use the results of that to calculate what the reference voltage you used (VCC) must have been to get the results you did. Depending on how close to 1.1V your internal reference voltage is, you may need to adjust the value 1125300L in the code above. Measure the actual VCC voltage and adjust that value until it results in the same voltage being returned (multiplied by 1000 since that function returns millivolts). However, as Edgar Bonet mentions, you don't need to care about the supply voltage in your situation, since your thermistor readings are just a ratio that input voltage, whatever it is. Change the input voltage and you will get the same results, since the ADC returns a value between 0 and Vcc in 1024 steps. With different supply voltages you still get 1024 steps. The Nano has an ATMega328P MCU, which has an internal 1.1V reference voltage. You use analogReference() to change the reference voltage that analogRead() compares the analog inputs against. You will need to use a voltage divider to ensure that your maximum possible supplied voltage ends up being no higher than the 1.1V reference. You'll still need to use an analogInput pin. Not the answer you're looking for? Browse other questions tagged arduino-nano analogread voltage-level temperature-sensor or ask your own question. What are the 5V and VIN pins for? Arduino Nano gives 7V on the 5V PIN! Does ADC conversion to a voltage rely on the actual value of the +5 V pin?